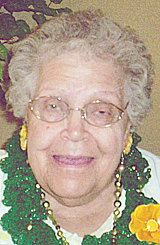 NEW ULM — Pearl May Roiger, age 89, of New Ulm died on Monday, January 28, 20189 at Oak Hills Living Center. Visitation will be on Tuesday, Feb. 5 from 3 to 6 pm and will continue Wednesday, Feb. 6 from 10 to 11 a.m., followed by the funeral service at the Minnesota Valley Funeral Home-NORTH CHAPEL with private family burial to follow. Pearl is survived by her sons, Gerald (Marlyndia) Roiger, Patrick (Susan) Roiger; grandchildren Emily (Matt) Hagberg, Scott ( Brittney) Roiger; great-grandchildren Avary, Madden, Haven, Ellie, Ava; brothers Dale (Shirley) Hacker, Fred (Betty) Hacker and many nieces and nephews. She was preceded in death by her husband Dennis; her parents; sisters Alvina and Sylvia and brother Ervin; in-laws Ambrose (Elizabeth) Roiger and sisters-in-law Shirley and Dianne. Pearl was born on May 24, 1929 to William and Maymie (Krogman) Hacker. Pearl grew up in New Ulm and was united in marriage on Feb. 7, 1948 to Dennis W. Roiger. Pearl was first a wife, mother and homemaker. She was an extraordinary, extremely talented women and a bit mischievous. She was an unbelievable cook, loved to sew and quilt, oil paint, ceramics, wood carve, read and make things for her family and friends. There was nothing she couldn’t do and spoiled us all. She did furniture reupholstery from her home for 30 years, later working at Oak Hills in the kitchen, Panasote Co., and finally worked at the Catholic Pastoral Center as Bishop Lucker’s personal caretaker and cook. Pearl will be sadly missed by her family including her family of 17 years at Oak Hills Living Center, friends or anyone else that was lucky enough to cross paths with her.